What is a Niche, and How Do I Find Mine? When you own a business, it’s crucial to stand out from the pack. In order to stand out among other businesses, it’s helpful to find or create a niche. 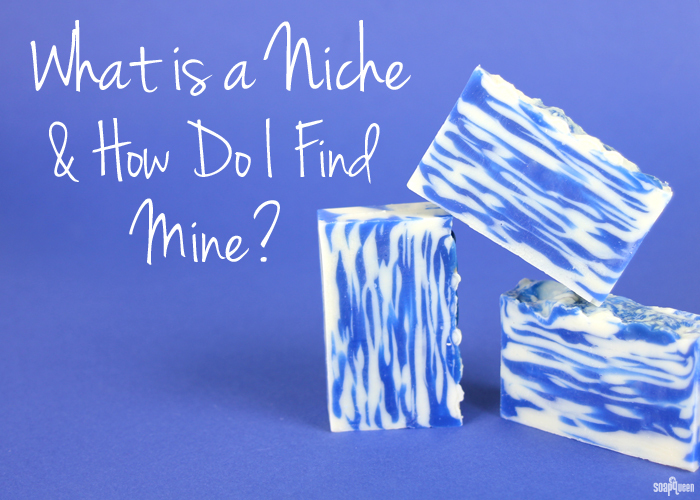 The term, “niche,” refers to a distinct segment of a market. Having an identifiable element will catch the eyes of customers that identify with the niche, and may motivate them to buy. Developing a niche also gives your products specific appeal and contributes to strong brand identity. When first starting a business, uncovering your niche can be difficult. Don’t overthink it; a niche can be as simple as a signature fragrance, ingredient or product design that will appeal to specific customers. In order to develop a niche, it’s important to first consider your strengths and weaknesses in all aspects of your business. Discovering your business strengths and weaknesses is a learning process, and pays dividends beyond finding your niche. Ideally, a niche will build off your strengths. Why do you feel passionate about your business? What do you love about your products and customers? Why do you love to make your products? What do you do differently than others in your industry? What makes your style and voice different from other soapers? Who is your customer base, and how are they unique? What do your customers like most about your products and business? Another strategy to develop a niche is to consider what viewpoint is missing in the market. Identifying a hole in products or services being offered is a great opportunity to offer something new. If you’ve identified a niche market that needs attention, make sure you feel confident and passionate about it. For example, maybe there is a lack of businesses that make products for men. If you want to make “manly” products your niche, make sure you are passionate and excited about them! After all, if you’re not passionate about it, you probably won’t work at it much longer than the time it takes to develop your logo. Bottom line, businesses is hard and in order to be successful, you need to feel strongly about your niche. Burly Stone Soap Co. creates soap specifically for men, with large bars and unique names. Once you have found a niche, it’s time to develop it. Several businesses featured on the blog are great examples of soapers who have developed a strong niche. 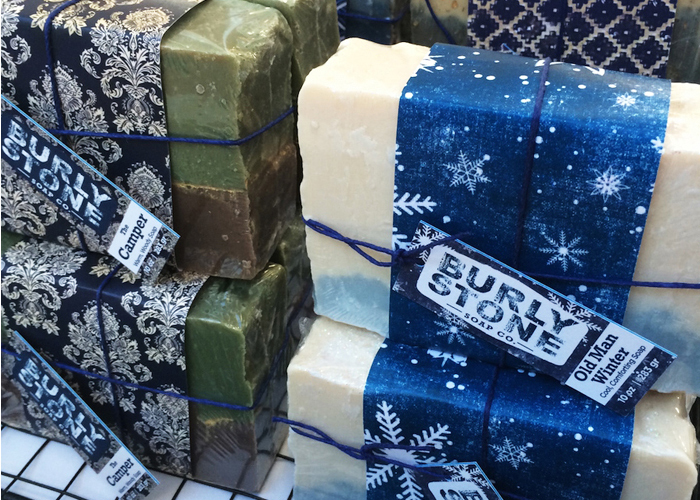 Burly Stone Soap Co. creates products specifically marketed for men. To develop their niche, Burly Stone created distinct “manly” packaging. Their soaps are large, and they also offer other manly products such as beard elixirs and hand balm. 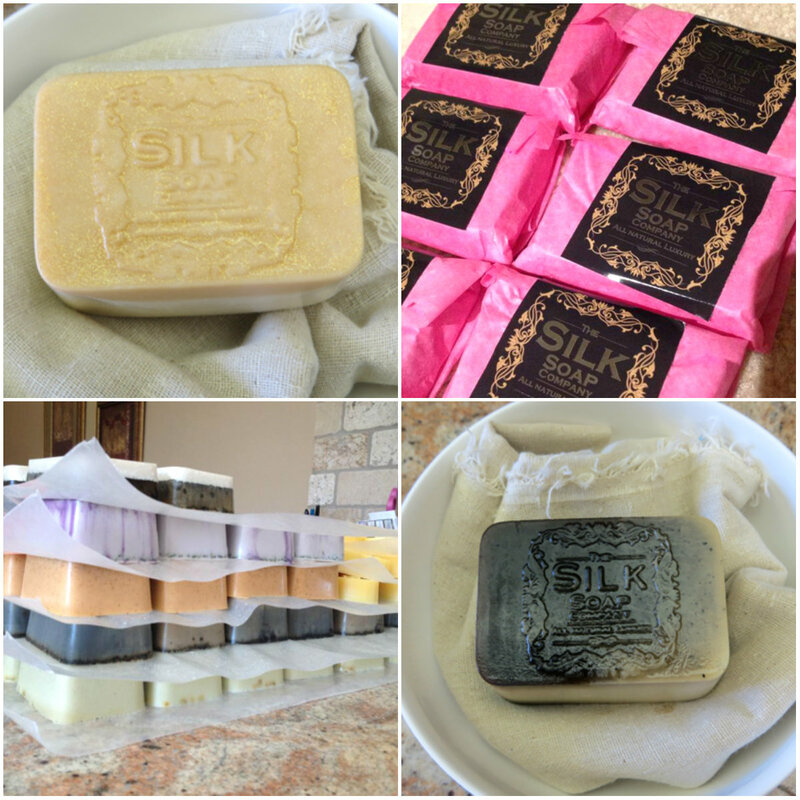 Another great example of a soaper who found a niche is Kirsten from the Silk Soap Company. Kirsten found there were not many companies offering soap containing silk, so she made it her specialty. All of Kirsten’s soap have added silk and are made in a mold unique to her. Just one look at her soap, and you know where it comes from. Kirsten from the Silk Soap Company found her niche by creating soap with added silk, along with a distinct packaging and design. While Burly Stone’s and Silk Soap Comapny’s niches are very different, they have a few things in common. Both soapers found a corner of the market they were passionate about, and played to their strengths. In addition, both niches were underrepresented in the market. If you feel that your niche is already represented in the market, brainstorm how you can make it unique again. Finding a niche takes time and research, so don’t be discouraged if it doesn’t come to you right away. Some businesses don’t fine tune their niche until months (or years!) down the road. If you are a business owner or are thinking about starting a business, I encourage you to strengthen what makes you and your business unique. Doing so will help your business stand out among the rest, which ultimately means more attention from potential customers. Do you feel your business has a niche? How did you develop your niche? I would love to hear about your experience. Great article! It really got me thinking about what direction to focus on with our new candle company. I really appreciate the advice! Thanks! What a great read!!!! Really knowing what you want to your product is all that it takes. Of course the passion too. I can’t stress that enough. Lol. From the look of the finish product and the packaging, to the ingredients, to me are the determining factors when I buy products. One way of me finding my niche was handing out survey questionnaire to people. Asking them questions like : “What drives you to buy a skin care product?” Or “What do you look for in a lotion?” . Believe me it really helped me a lot in deciding what ingredients I will put in my product. Patience is also a big factor. Fantastic read! Great questions to continually ask yourself as your business grows too. Thank you! I love this post so much! It is very encouraging, with great ideas. I have an idea of what I want my niche to be when I one day start selling soap. However, it will take a while to develop this niche, as I need to do a lot of experimenting with recipes before I can develop it fully. Thus, I don’t know if I should wait a few years until I develop it before I start selling, or start selling now and develop it in a few years and just change what I’m selling down the road. On the one hand, I’d like to start selling sooner than later. On the other hand, I don’t know if I want customers to come to know my business as one thing, and then I change it to another thing, and I end up losing customers. Advice, anyone? Anyhow, I love this post! Just as awesome as the article, though, was reading all the comments from all the different soapers and hearing about all their incredible niches. Soapmakers are so diverse and creative in their craft, and it is so inspiring to read about how they have all discovered something unique to bring to their soaps. You know, it took me about 6 months of questioning myself, my ideas, a whole lot of research, and even more “what ifs”. I decided to make my year. I know my artistic ability will grow with time, so right now I am concentrating on what I can do, and a need in the market that I can see. If you were sitting across the table from me right now I’d tell you to go for it. Your customer base is going to change and grow with you, but only if you jump into the soap pond. If you wait years they will add up. Make what you know & grow! I wish you the best of luck!! A niche is an important thing to think about. It is easy to get spread in many directions as creative people. Our niche is all-natural goat milk soap made with local milk. I found mine before I even started. I have several family members who are allergic to tree nuts, one so severe she can’t even have it on her skin or hair, let alone in her mouth. Half of my new business will be Tree Nut Free Soaps and Hard Lotion Bars (all of my Lotion Bars will be Tree Nut Free) I’m using Bramble Berry’s Castile Rebatch Soap for Hand Milled tree nut free soap. The other half of my soap line will be M&P. I’m excited! Consider not only your niche, but your local market. If your local market is a large metro area, imagine your “ideal” customer. It’s okay to start small! It will grow if you have a good thing going! As a beekeeper, I make soaps that ALL contain honey and beeswax. My local market is rural, and small town, so lard and tallow are natural ingredients. Everyone remembers Granddad’s bees, and Granny’s lard soap. I’ve been approached about selling at farmer’s markets 100 miles away in Austin. That’s a different world. I can sell my “regular” products, while explaining that for me, lard from locally raised hogs is much more environmentally friendly than an all plant-based GMO oil soap. But I also added a vegan option — no honey, no wax — and used hemp oil. Some of my avowed “vegan” customers had not thought about GMO soy, corn and canola, or the carbon footprint of ordering and delivery of coconut, olive, almond, etc., and began using my lard soaps when I explained that unused lard goes into land fills. No one raises hogs *just* for lard, but many raise GMO soy for anything *but* a human food source. I also taught people that USA beeswax IS resource-intensive — bees consume 8 lbs. of honey to make 1 lb. of wax — but that no harm comes to the bees from harvesting excess wax and honey. It is against the law for me to destroy a hive to collect ALL the wax and honey. Knowing how and why I use what I use, makes them better-informed consumers — and VERY enthusiastic about my products. YMMV. Silk, beeswax, a scent, or packaging. Find what makes you stand out, and zero in on it. It will grow itself naturally from there. Thanks for sharing your awesome advice! I’m sure many readers will find it incredibly helpful. I started out making soap for our family with our excess goat milk soap. Quickly family and friends wanted to try it and my business started. My niche is to make a quality soap at everyday prices so most anyone can afford to use it. Today I have seven wholesale customers and sell on Etsy as well as a few craft shows each year. That is so amazing that making soap for your family turned into a business! That is such an awesome accomplishment. We started out with the niche of just goat milk soap from goats on our small holding. Then, the business grew so much that we buy local goat milk. Our niche is goat milk soap, focused on all-natural ingredients and healthy skin care. Thanks for this post and helping me think more deeply about it! A very important subject for a business since sometimes it seems like every niche is filled – but thinking about how your business fits and focusing ideas for it is important. Local goat milk is such an awesome addition to soap! It makes for a very luxurious bar. It can definitely take some time to find a niche, that’s for sure. That’s a great tip Margaret – as you continue to soap, that niche will likely start to develop organically! I sell from medical offices and online. I do not sell in farmer’s market’s, home stores, or boutiques. I do have some churches I sell through because I know them, but it has still been marketed the same. I use my oncology biochemistry PhD to my advantage. That’s what we all should do. I know a lady in a soaping group who is very spiritual…all of her soaps are like walking into the best herb and spirit shop in the world. I know another who raises goats, so all of hers come from her goats milk. You have to use your personality to an advantage. I think the biggest weakness I see people in the soaping business have is this belief that they have to mimic lush or other big companies. When it comes to bath and body products people want YOUR personality because they are buying a piece of you. I see those that do the best know who they are and lift up other soapers and so on. I love to see other’s succeed and it has even brought me business! Also, I totally agree – letting your personality shine through is a great way to market and sell your products. Thanks so much for sharing your awesome tips! I am just at the beginning stages of this part of our business. I have already found my niche but yet to test it on the public. We raise the endangered large black hogs on our farm along with many other rare and nearly extinct breeds of livestock. We will be starting to sell at a local farmers market this summer and have decided to add soaps to go along with all of our other products we offer. We have decided to process all of the left over fat from our pork sales and process all of our own lard that is used in my soaps. That is the only oil I use in my soaps. So our soaps are hand made right down to making our own oils. I am also offering felted soaps and I’m crossing my fingers that my products will do well. Wow, that is quite a niche! That’s an amazing use of your excess fat – and such a great story for so many reasons (sustainable farming, using all parts of the animal, environmental reasons etc). I’ve noticed that felted soaps really have a higher price point than traditional “naked soaps” so that makes sense that you’d add that as an option – especially if your niche is animals/farms because of the wool addition. Good luck with your business. It sounds like you already have a thriving one so that’s exciting! Thank you Anne-Marie! To be honest I am very nervous about starting to sell my soaps. I love making them but since we haven’t sold any yet not sure how well they will go. I hesitate getting too involved until I test the market. So at the moment only have one mold and if all goes well will be adding many more things. My fingers are crossed that it will be a success. Your encouragement is greatly appreciated! Thank you! I just came back to this post this morning to see what others had written and was happily surprised to see the positive response to my comment. It makes me feel better about my choice to add soaps to our product list. We truly love what we do and I am taking a big leap this summer quiting my day job and going full time at the farm. It is a bit scary but the positive feed back I am receiving here reinforces I am doing the right thing! That’s amazing that you were able to turn your passion into a business! I think every business is different. Some have a niche that just- happens! Other businesses don’t have a niche until they start selling. Sometimes your customers know your niche before you do!